(The real Harold) Meyerson has a beautiful piece up at the American Prospect (How the Bronx came back (but didn’t bring everyone along)), which describes the uneven, delayed, and incomplete, yet nonetheless impressive economic resurgence of the Bronx. Now York’s most challenged borough has seen some striking gains, not least a jaw-dropping decline in homicides, from 653 in 1990 to just 95 last year. Harold’s article has personal resonance for me, since many of my relatives lived in the Bronx during my childhood years.Â My grandmother lived in a modest apartment at the intersection of the Grand Concourse and Kingsbridge Road. When I was a small child, I sometimes used to sleep over. Â She had a rough life in many ways. She held her family together in the face of various crises. She was revered by our family. In her retirement, she took up oil painting, needle point, and even sculpture. It turned out that she was very good. She presented one of her needlepoints to Senator Robert Kennedy during the 1968 campaign. Â As a five-year-old, I was too nervous to shake the Senator’s hand at the presentation. A few months later, he was dead. I remember my family sitting stone-faced in front of our small black-and-white TV watching the news trickle out. The King and the Kennedy assassinations were my first specific experiences of death and political tragedy. I remember catching snippets of TV news footage with weeping people and rioting during the most shattering year in postwar American history. I wish that I could have known my grandmother better. FortunatelyÂ I am blessed by some precious things she left behind. The oil painting below shows the view from her apartment window. In my mind’s eye, that’s what I saw as a three-year-old on my tiptoes, stretching to see over the sill. That picture hangs over my fireplace. It turned 50 this year. 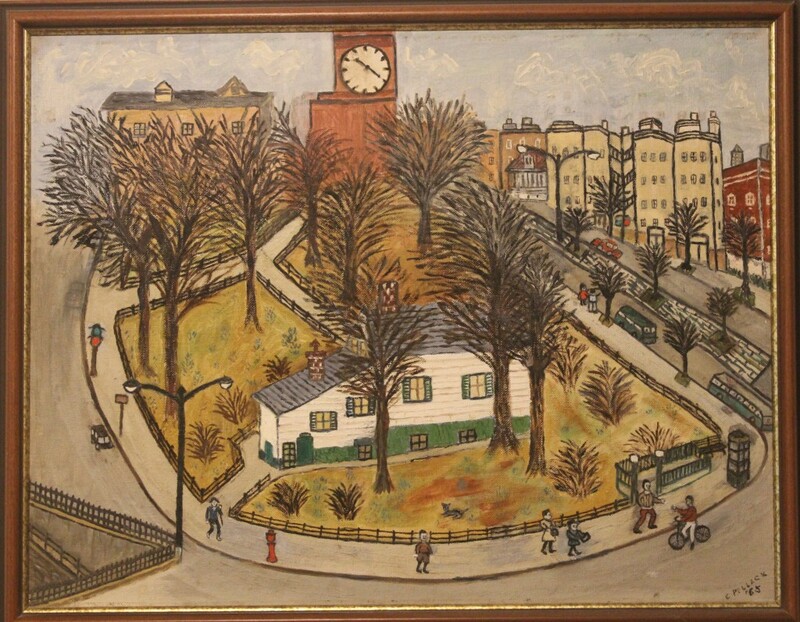 The view of Poe Park, from Grandma’s window (Painting by Ethel Pollack, 1965).